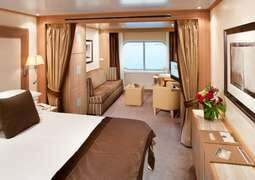 An ideal ship for the perfect cruising experience with spacious staterooms, delicious cusine and much more. The Seabourn Odyssey set sail in 2009 after being built by T. Mariotti S.p.A in Italy. Carrying 450 guests and 330 crew. 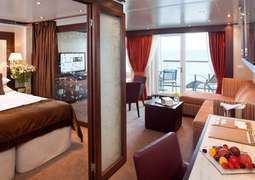 Its size along with the low volume of guests means that this ship has one of the highest space-per-guest ratios in the cruise industry. With 8 guest decks onboard the ship and 229 ocean view suites in 13 categories. The standout suites onboard the ship are the Wintergarden and Signature Suites. The Wintergarden Suite has a private glass solarium with a hot-tub and bed and the Signature Suite has 84sqm of inside space and a 32sqm balcony to enjoy. Dining onboard the Seabourn Odyssey will, without doubt be a wonderful experience. The Restaurant is the main dining room on the ship and serves a range of classic and beautifully crafted dishes. Restaurant 2 is a wonderful alternative venue which has a special 7-course menu which caters for guests who are after something a little different. 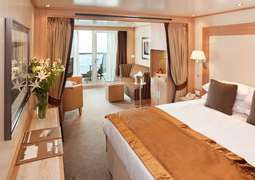 The 225 luxury suites aboard the Seabourn Odyssey leave no wishes unanswered. With an area of up to 112m² and their elegant and supremely comfortable design, these suites are the ideal place for you to relax on your cruise. 90% of the suites are fitted with their own veranda. The Wintergarden Suites are a special highlight with their own private glass solarium, in which there are a pool and a deck. Each of the suites has a view of the sea and are equipped with amenities such as a mini-bar or walk-in closet for your convenience. Sit back and enjoy the beautiful view while your personal attendant tends to your requests. The four great restaurants invite you to enjoy a true culinary dream. The Colonnade restaurant offers you the choice between eating in- or outdoors as there is comfortable seating available for each case. That’s just the icing on the cake! At the Colonnade, you can expect a sumptuous breakfast, lunch buffets and themed dinners with excellent service. The second restaurant offers innovative dish creations each evening for degustation. A reservation is recommended as this is the main restaurant on the Seabourn Odyssey. You can have breakfast, lunch and dinner here, or just eat whenever it suits you, regardless of the time. Do you want to enjoy a relaxed and casual atmosphere as well as great food? Then visit the Patio Grill by the pool, where you will be able to choose from a delicious variety of grilled meats, salads and side dishes… Not to forget the freshly baked pizza, served throughout the whole afternoon! While you are relaxing by the pool, you can stay refreshed with the selection of exquisite cocktails, wines, juices and ice cream on offer at the Patio Bar. If you want to enjoy the sight of the pool from a more private perspective, then visit the Sky Bar. The Observation Bar excels past all competition with its unique design. You can enjoy live piano music and a 270° panoramic view with a cup of tea in the morning from the circular lounge, which is smartly fitted around the square bar. There is another cozy café located at the Seabourne Square. A great range of activities and entertainment awaits you aboard the Seabourn Odyssey. Pick your spot from one of the 36 double loungers on the sun terrace and leave your worries behind! The pool patio is a spacious open deck with a swimming pool, whirlpool, loungers and sun umbrellas. Every so often a live show will be performed on the stage. At the Seabourn Square you will find a comfy lounge with chairs, sofas and cocktail tables. A library and a number of computers are also available for use. All the while, you will be served by friendly staff members who will gladly tend to your wishes. The three duty free shops aboard the Seabourn Odyssey have a range of articles on offer, especially fashion related. You will be able to choose from perfumes, jewellery and other luxury items. Bring your friends to the game room and enjoy some fun, interactive Wii games on the large screen, or play a game of cards. Miss the good old days of board games? Now is your time to catch up! Choose your favourite from Monopoly, Scrabble and many others. For the younger kids, there’s also a fun selection of puzzles to choose from. The Grand Salon always proves quite popular with its daily film screenings, cooking demonstrations and lectures. Enjoy live music before dinner and musical performances, variety shows, comedy shows and dances after your meal. If you are in the mood to dance, head over to The Club, where you will be able to show off your moves to some live music. At night a DJ will be taking care of the music selection on the terrace by the pool and two whirlpools. If you are feeling lucky, head over to the casino and take a few turns at the slot machines or play a round of blackjack, roulette or poker. 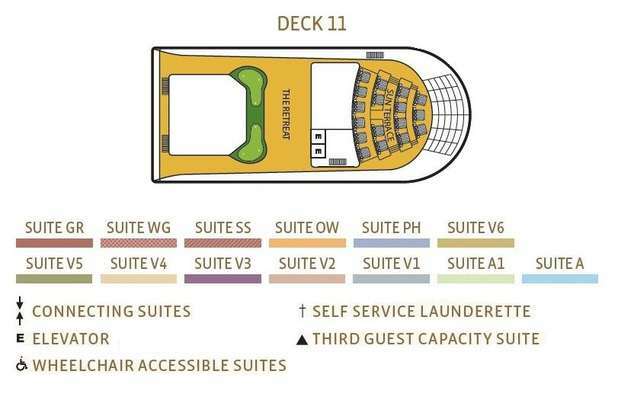 The spa area of the Seabourn Odyssey is spread over two decks, spanning a total of 1,000 square meters. With six treatment rooms, a spa area with a hydro pool, dry raft, sauna, steam rooms and a range of Thai massages, you will be able to choose the exact service to suit your needs. For some serious indulgence, use the heated loungers located in the private spa villas on the open air spa terrace. The ship is full of pools, but if you prefer relaxing rather than swimming, you will also be able to use one of the many hot tubs. Take advantage of the full service studio and fitness centre, which is fitted with a Kinesis Wall, allowing for a variety of light resistance exercises. If you fancy some a competition among family or friends, head over to the Retreat to use the 9-hole putting green course and perfect your shot on the shuffleboard. In addition, the ship has a retractable water sports marina, which is can be used depending on weather conditions. You will be spoilt for choice between the windsurfing, water skiing, kayaking, banana boats and paddle boats on offer at the marina. For an unforgettable experience, make the most of the steel mesh pool with which you can safely swim in the sea itself! During the day, you are welcome to wear casual clothing. For the evening a smart-casual suit is advisable. For the optional formal nights it is recommended that men wear a tuxedo and women a cocktail dress. On these nights passengers will be required to wear an alternative to jeans in the restaurants and lounges. As for shore excursions, your clothing selection will depend on the destination. Passengers under the age of 18 will need to be accompanied by an adult of no less than 21 years throughout the whole cruise aboard the Seabourn Odyssey.